What if shopper marketing could deliver more than just a bump to your bottom line—what if it could create a bond with shoppers? We believe it can; that’s why we created Shoptology. We’re a team of experienced agency leaders and entrepreneurs, collaborators and innovators—creative scientists obsessed with building meaningful bonds with shoppers. By understanding the shopper journey in context, our insights uncover ways to create attraction between elements—and drive purchase. 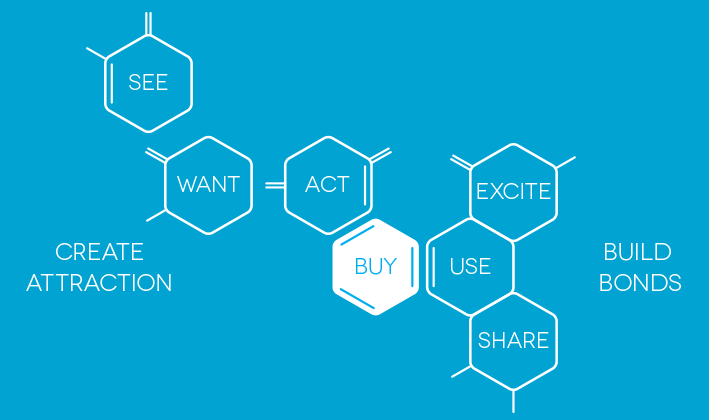 Our formula is a breakthrough in looking at how shoppers buy and is built on two basic principles: ATTRACTION and BONDING. Since one shopper’s “SHARE” could be another shopper’s “SEE,” we are able to determine individual shopper relativity—adapting each formula to each shopper—to create a more effective bond.